Gemi José González López, studied at the Escuela Libre de Derecho in Mexico City, earning his degree with honors for his thesis and performance in the professional examination. Consul González López, also holds an MA in European Law by the Universidad Complutense de Madrid (U.C.M) and another MA, in applied Political Studies by the FIIAPP-Madrid (International Foundation for Administration and Public Policies). Additionally, he has a Ph.D. in International Law and International Relations from the UCM as well. He has also taken several postgraduate courses at Harvard, Georgetown the Carlos III University and Standford University. Consul González López has lectured on Constitutional and Administrative Law at the Universidad Iberoamericana, in Mexico City and, has been a University Professor for the courses: Analysis of Socioeconomic Problems and Environmental Law at the Escuela Libre de Derecho in Mexico City. Currently, he is the Professor of Environmental Law at the same school. He has also published the book El sistema político mexicano (The Mexican Political System, Porrúa, 2004), along with various specialized articles in a weekly column on international affairs, “Hemisferios Politicos” (Political Hemispheres) in the newspaper Excélsior, which were later compiled and published by Miguel Angel Porrúa (2013). Dr. Gonzalez is an active member of the Mexican Bar and the Mexican Council of International Affairs. He was in charge of the press office at the Mexican Mission to the United Nations in New York. He is a founding partner of the law firm González Fernández Abogados, S.C., as well as the consulting firms Gobernanza Consultores and Global Policy Strategies. Consul Gemi González has been a frequent contributor and regular analyst for various programs: “Pensar Mexico” and “Punto y Coma” at TV channel Proyecto 40, besides being a host for “TRES en 30” on Efekto TVand has participated as a speaker at various international forums. 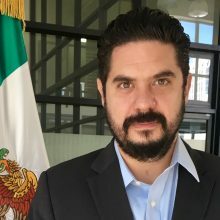 During this administration, under President Peña Nieto, Gemi José González López, has been General Director of Government Relations and, Chief of Staff of the Secretary of Communications and Transportation, as well as Deputy Attorney General for the Federal Environmental Protection Agency (PROFEPA).